There are different ways to access your favorite sites which are blocked at your office/school/university. In our previous post we explained you 4 easy and simple tricks to access blocked web sites. In this post we explain you the different tricks to access blocked Orkut web site. Using PowerScrap web site to access Orkut is the one of the easiest and most reliable way to unblock Orkut. 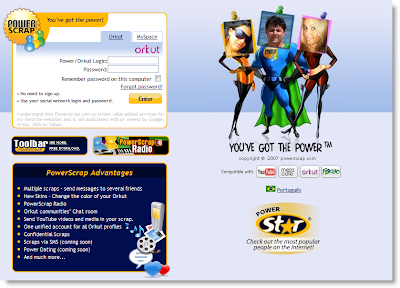 PowerScrap is a safe, fast, reliable and very powerful site to interact with your friends in Orkut. In most of the organizations access to images.orkut.com is not blocked. If your organization has not blocked this site then you are very luck. Accessing orkut through images.orkut.com is same as accessing orkut directly. 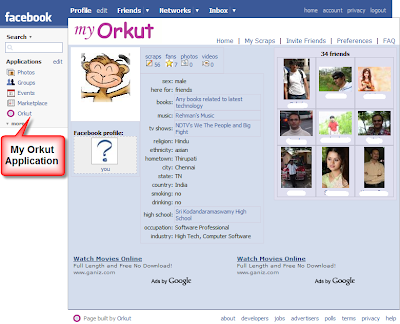 If you have Facebook account then you can use My Orkut application of Facebook to get access to Orkut. http://www.orkut.com/Profile.aspx?uid=1820189889131874780. You can get to the URL by clicking on your own Photo after signing in to Orkut. That's all. Now you can access your Orkut through Facebook. I hope at least one among the above three tricks works at your organization/school/university. Happy Orkuting!! Do you know that the world class Anti-Virus program Norton Internet Security 2007 is free with Google Pack? Google is distributing free Norton Anti-virus software for all the users to ensure safer browsing. Download it right now and keep your computer safe.